This 30-Day Water Challenge is designed to help you get in the habit of drinking enough water to stay well hydrated. It’s a fun, easy way to stay motivated for 30 days. By the end of the challenge, drinking 64 ounces of water a day will be second nature. You won’t have to track it, or even think about it since you’ll be drinking water throughout the day out of habit. In addition to the benefits listed above, proper hydration is also associated with healthy weight management, clear skin, and preventing bad breath. So by the end of this 30-Day Water Challenge, you should be looking and feeling better simply by drinking ample water! Most of us don’t HATE water. Though we may prefer it with a little flavoring added, very few people are dehydrated because there’s anything wrong with water. We simply don’t think about drinking until we’re really thirsty. I’ve found it really helpful to keep a water bottle on my desk. It sits there as a constant reminder to hydrate. Plus, since it’s right there all day, it makes drinking water convenient. Of course, like most things, once you get used to something in your space, you start to look past it. It becomes a part of the scenery and its mere presence isn’t enough to prompt action. That why I switched to a water bottle that has time markings. Now I can see at a glance whether or not I’m on track with my hydration goals for the day and I can adjust by drinking a few ounces more in the middle of the day, rather than trying to jug 20 ounces right before bed. So, whether you want a colored water bottle or a clear one, a wide-mouthed bottle or one with a straw, BPA-free plastic or glass, or practical vs. whimsical, there’s a time-marked water bottle that is just right for you. Of course, you can do the same thing with ANY water bottle. Just use a permanent marker or washi tape to mark times and water levels. Water isn’t the only way to stay hydrated (though it’s the best). However, some people don’t like to drink plain water and struggle with drinking so much of it each day as a result. Ironically, there are several beverages that dehydrate you. If you can, avoid these. And if you do drink them, offset their dehydration effect by drinking an equal amount of water in addition to your 8 glasses per day. When it comes to other beverages that aren’t listed above, like juice, smoothies, lemonade and energy drinks, you don’t have to avoid them but do pay attention to the amount of sugar and chemicals in them. While they may not sabotage your hydration goals, they could have a negative impact on your overall health goals. 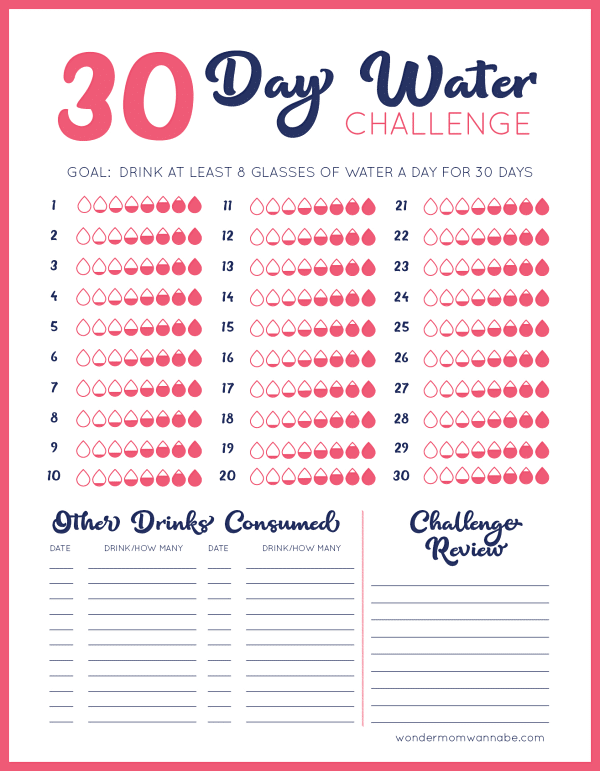 This 30-Day Water Challenge printable is just a simple visual tracking tool to keep you on target. Post it somewhere where you will see it several times each day to remind you to drink water so you can check off water drops. There’s space for you to write in non-water drinks in case you want to track that day you tried chlorophyll water or drank way too much coffee. There’s also a space for you to record your thoughts after you’ve finished the challenge. Take a few minutes the day after to evaluate how you feel (hopefully you’ll notice positive effects) and make a plan for maintaining your hydration habit. 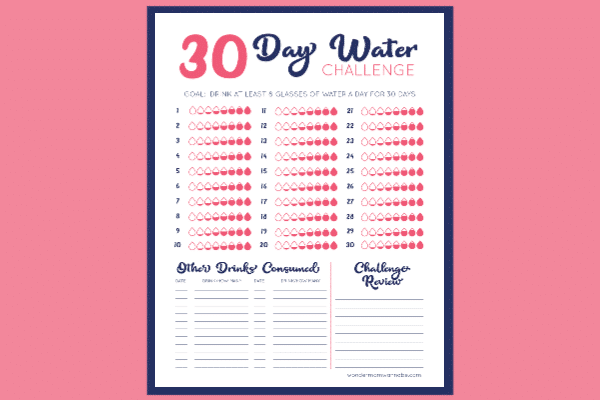 Ready to tackle the 30 Day Water Challenge? Just click the image below to download and print the calendar. After you’ve finished all of the tasks in the 30-day Water Challenge, you may love the accountability of checking off your water consumption each day. If so, you can certainly print off a new copy of the tracking sheet and continue using it. If you feel like you have your hydration under control, you can move onto other health habits. Check out my 30-Day Challenge for a Healthier You to tackle general health goals. Or download my fitness tracker to stay motivated to work out regularly. 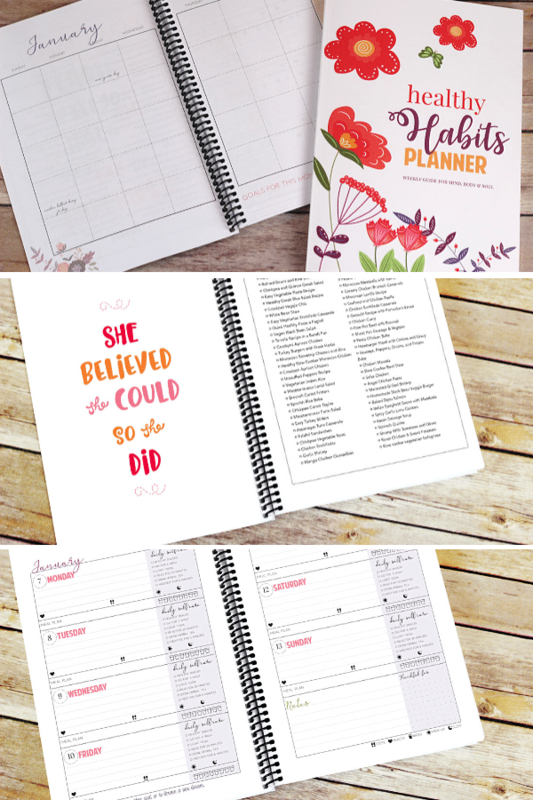 If you’d like to integrate your health goals and habits into your everyday life, consider getting the 2019 Healthy Habits Self Care Planner. It’s full of inspiration, ideas, and places to track all of your healthy habits. It even has a hydration tracker for each day! Congratulations on taking a step towards improving your health. I hope this 30-Day Water Challenge makes it easier for you to develop a daily habit of good hydration and that you reap the benefits for years to come! I needed to read this! I need to drink more water. Oh I need this.. I am so bad at drinking anything. I did manage to get in 20 ounces so far today but that is a far cry from 64! Pinned.